Welcome to the second Thursday Moda of 2017. 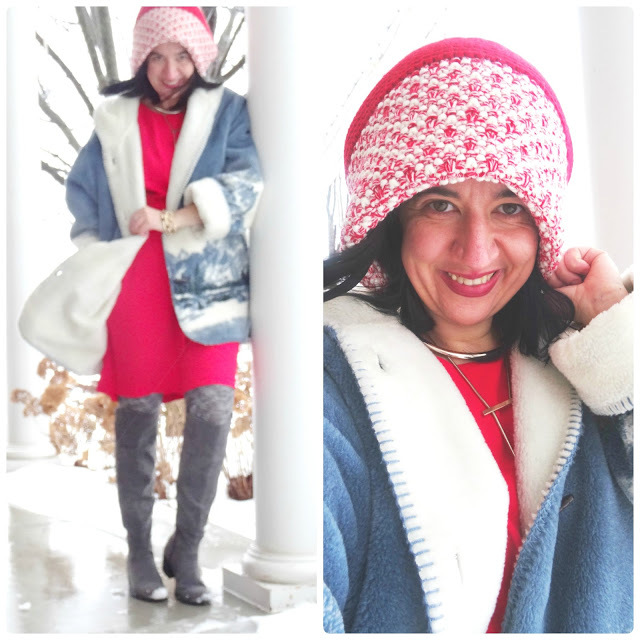 I promised you would see these Gray OTK Boots and this time around I paired them with a Fun+Flirty Red Dress - another dress from Loft - and what I planned to wear it, this past New Year's Eve, originally (but I didn't). ...Which brings me to today's post and co-host. You may remember SARAH from My Bows & Clothes from 6 weeks ago, when the two of us "vowed" to wear Dresses all December long in order to support a very important women's cause - Dressember. We had decided to wrap up our month of dresses with dresses we wore (or in my case I would have worn) for New Year's Eve. Sarah, unexpectedly, wore a Black Maxi Dress but it was very appropriate for New Year's Eve because the bust is completely sequined and she added a Sparkly Crystal Statement Necklace with it. So, last year I got the Loft/Ann Taylor Card and it is both a blessing and a curse let me tell you because it makes me love and shop the Ann Taylor brands even more. On their Holiday catalog, there it was The Perfect Red Dress. I had been looking for the Perfect, Knee-Length Red Dress that had some type of Ruffles since I wanted a dressy type. Though you cannot see it here due to the coat, this Sleeveless Dress has Flouncy Ruffles around the sleeve holes and sides. So, after it went on sale and a coupon, I took the plunge and decided to purchase the Perfect Red Dress and wear it for New Year's Eve. But a couple of days before the big sparkly night, I decided to do something unexpected (for me) and go for a jumpsuit instead. We were going to go to a fancy, family-friendly, huge dinner party on NY Eve night and Vivian was coming so I figured pants or a jumpsuit would be best for me to run around her and I would be more comfortable. 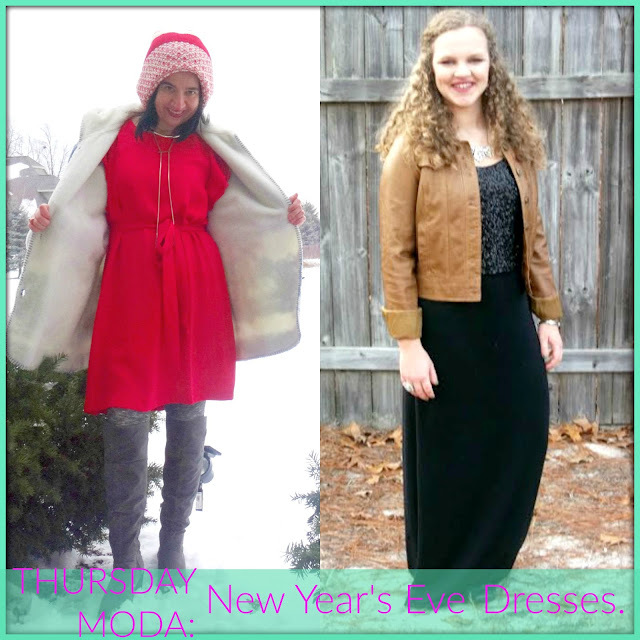 I plan on posting that outfit next week for Thursday Moda (so stay tuned). Lucky for me, a few days before New Year's Eve, my cousins and I got together for a dinner for the holidays and I decided to wear my red dress instead. But as you see, it was very cold and snowy. So, I paired it with an Oversized Plush Hoodie Coat (I had borrowed from mom) and dress it down a little bit with Marled Gray Leggings and my Gray OTK Boots. But I did add some Fun, Gold-Tone Jewelry: bangles and a 2-in-1 Choker Necklace which had a Lariat Chain in the front too. For the makeup I kept it simple with mascara, blush on the cheeks and my "Touch of Berry" ELF Lipstick. 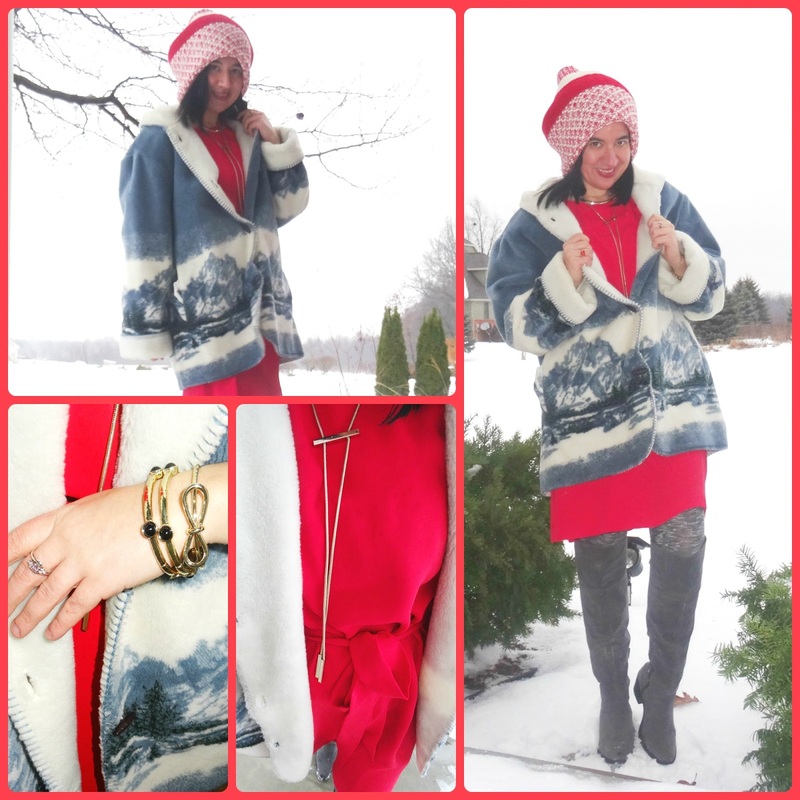 The Stunning Coat has Snow-Covered Mountains on the bottom, too - such a cool Winter pattern. I kept the oversized theme with my Winter accessories, so the Red+White Marled 'Hat' is actually a Snood which I wore as a Slouchy Beanie. I totally plan on styling this Gorgeous Red Dress completely different for Valentine's Day so stay tuned for that. I also plan on borrowing this Lovely Coat again though it is quite large on me - I love it! Red, Knee-Length Sleeveless Dress w/ Ruffles off the sides of the arms: Loft (New) (similar, Huge Steal), (similar, on Sale), (similar, w/ long sleeves, my Favorite), (similar, Small Splurge, love this). White+Blue Snow Mountain Patterned Oversized Plush Coat w/ Hoodie: Borrowed from Mom (similar in B+W Buffalo Plaid, Great Deal, love this), (similar in beige pattern), (gorgeous colorblocked option. Splurge, my Favorite). Gray Marled, Athleisure Cropped Leggings: Target (New) (similar, Huge Steal), (similar, Great Deal), (similar, on Sale, love these), (similar, Splurge, love these). 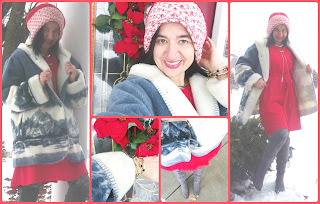 Red+White Marled Snood (Scarf): Gap (similae, Steal, love this), (similar, Fantastic Deal). 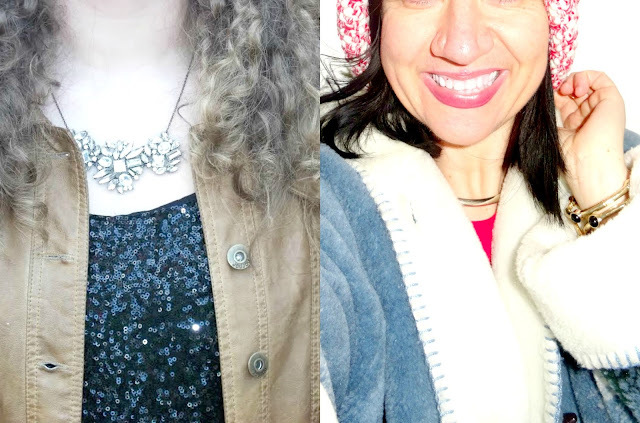 Gold-Tone 2-Stranded Circle Choker & Lariat Chain Necklace: White House Black Market (New) (very similar), (similar current option from WHBM, Steal, love this), (similar current option from WHBM), (similar mixed metal option, Splurge, my Favorite). Bare Satin Deep Red/Burgundy/Dark Berry Lipstick: "Touch of Berry" by E.L.F. (identical + I love it! ), (similar option by E.L.F., Huge Steal), (similar, Small Splurge, my Favorite). 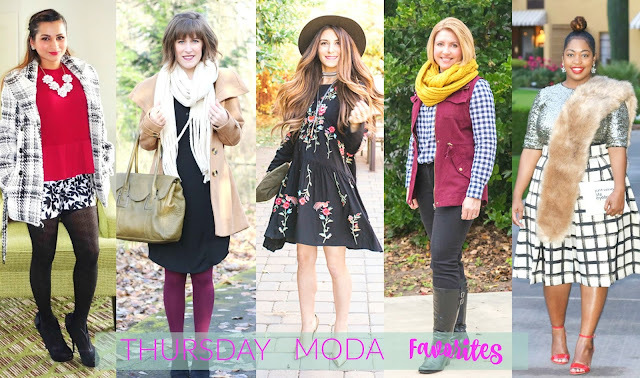 My favorites from last week show us that Black Boots/Booties, a Felt Hat, Fun Tights, Plaid, Cute Scarves, Layers and let's not forget a Great Coat are Winter staples. Thank you to all 106 of you who linked up and brought your A-game to my linkup, making it hard for me to choose my favorites, this week. 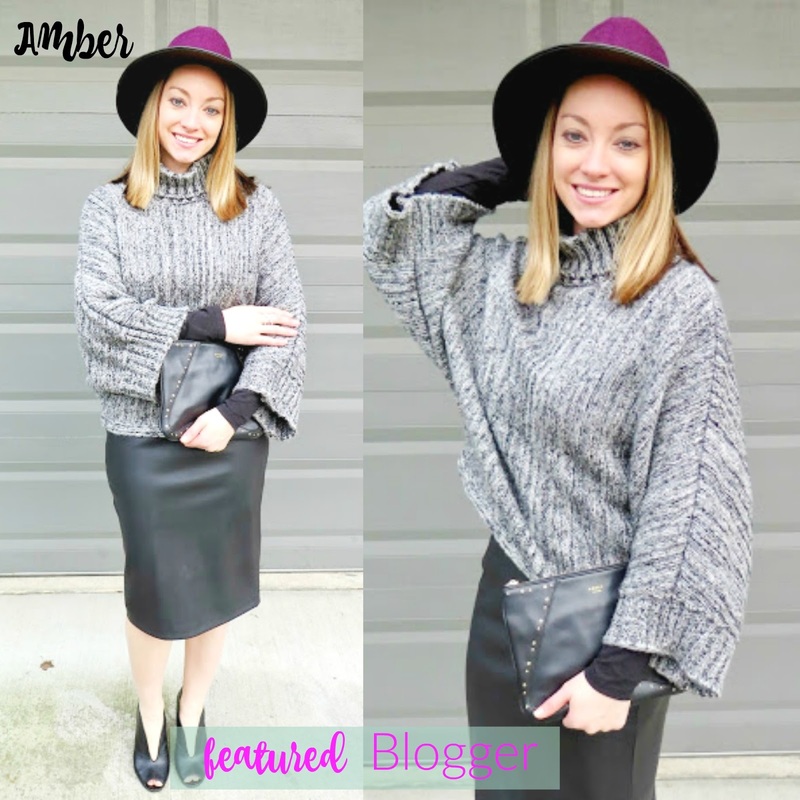 This week's Featured Blogger is AMBER from Avec Amber - a stylish professional who blogs from Seattle, Washington. Amber linked up this Black Monochrome Dressy Look featuring a gorgeous batwing sweater, the best-fitting leather black pencil skirt, a black leather clutch and fun black leather open-toe booties, but she also added a pop of color with that eggplant fedora which I loved. Amber has been blogging since 2012 like myself and I have followed her for about three years. Not only is she super stylish and you can be inspired by her style, but on her blog you will find gorgeous photos from all her travels across the world and all the fantastic restaurants she has eaten at. I love her fun travel posts and interesting restaurant reviews. Make sure you follow her if you don't already because you will love her amazing life, style, food and travel blog. Audrey gives us 'Pattern Mixing Tips' and we both agree nothing mixes better than patterns in black+white. Her coat and shorts are great. She brought some Summer into her Wintery outfit. Ruth shows us all the importance of a 'Classic Coat' and yes I think every woman needs a camel coat in her closet. Better yet she got her great coat for 5 bucks! Jessica is looking quite spiffy for a 'Free Week' combining boho with glam. Love her embroidered flower dress and fun lariat necklace and her hair is stunning. Fonda, 'It's Winter' here in Michigan - we can switch anytime, but I see your love for this season by combining cranberry with mustard. That vest is great. Joi is literally 'Stepping Out' in this fancy outfit of a sequined tee tucked into a beautiful grid midi skirt and topped with a fur stole. Love the message on her clutch and that she chose red shoes. 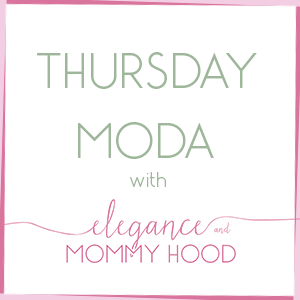 This week's Fabulous "Thursday Moda" Co-Host: My Bows & Clothes. Since Sarah and I wore a lot of Dresses in December, below I picked three favorite looks from 2016 of hers, featuring Dresses. I notice a color theme - blue - and Sarah looks lovey in it. "Hello, Elegance and Mommyhood readers! 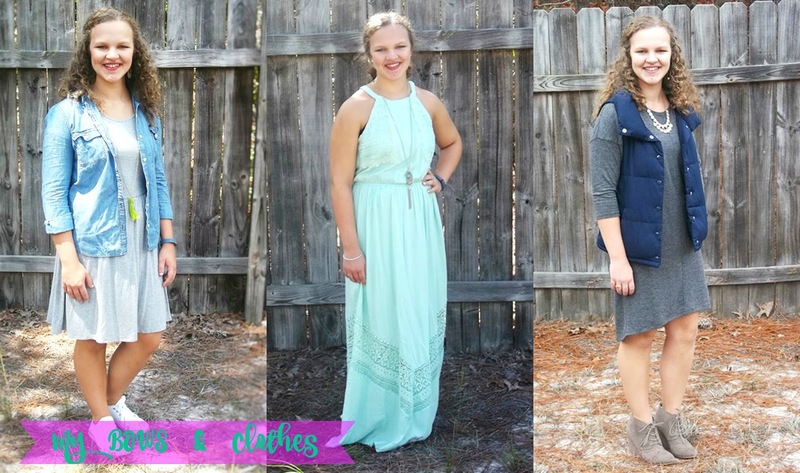 My name is Sarah and I blog over at Bows & Clothes. Bows & Clothes is a life, style and beauty blog. 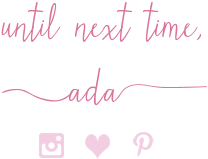 I share all things related to fashion and style, beauty tips, and some of my life adventures. I hope you would stop by! You can follow along on Instagram, Twitter, or Pinterest as well! Thanks, Ada for allowing me to co-host!"